It’s not often that you get to see behind the scenes at Two Birds London as we don’t have a shop front and aren’t open to the public. 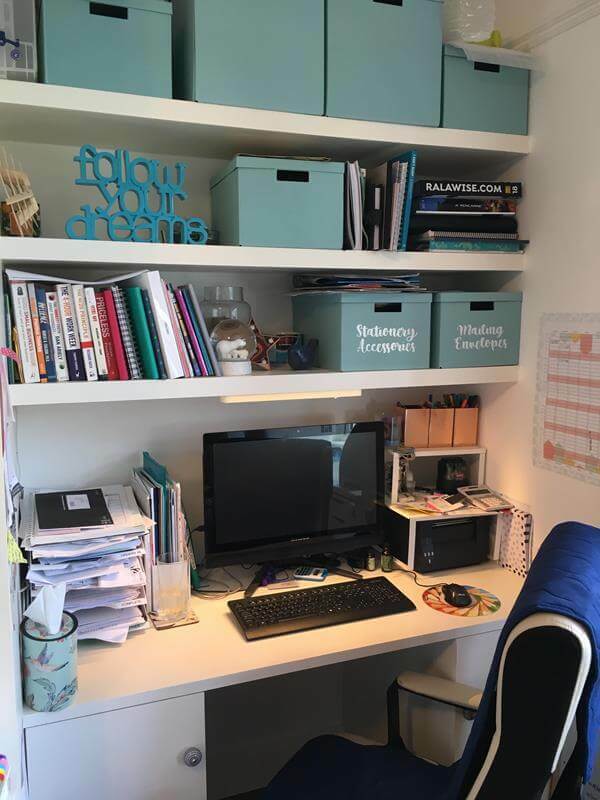 However, who doesn’t like to see what people’s work spaces look like so today we’re going to give you the full tour. We’ll start at my desk – its built into an alcove to the right hand side of what used to be the fireplace. 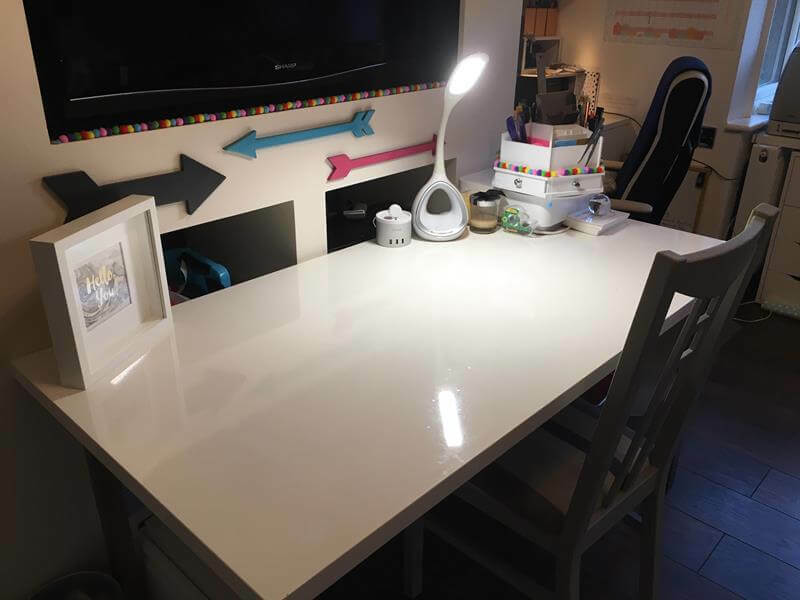 My office was originally the kids playroom and so the desks are quite small (there’s another one on the other side of the fireplace) as they were designed for my kids to do their homework on (yeah that never happened 😉 ). However, despite being a bit of a squash, I’ve got all that I need on the desk (and probably a fair bit besides!) 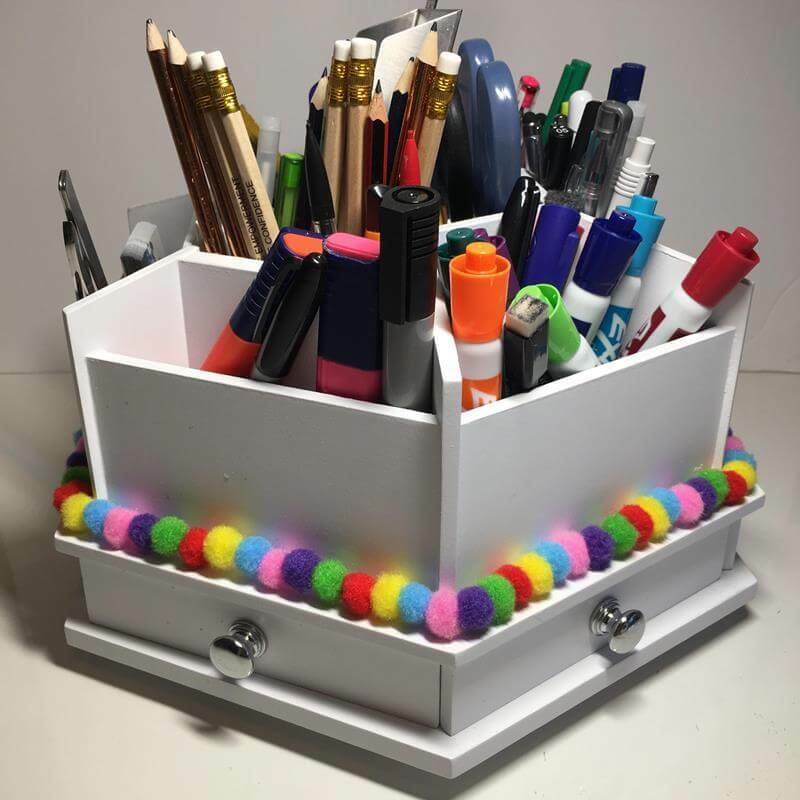 in the shape of a large screen PC, some pen pots, my filing cubbies and my address label printer. To the right of my desk, I have a long worktop set up in the bay window. This area houses all my printers and cutting machines as they all need to be connected to my computer. 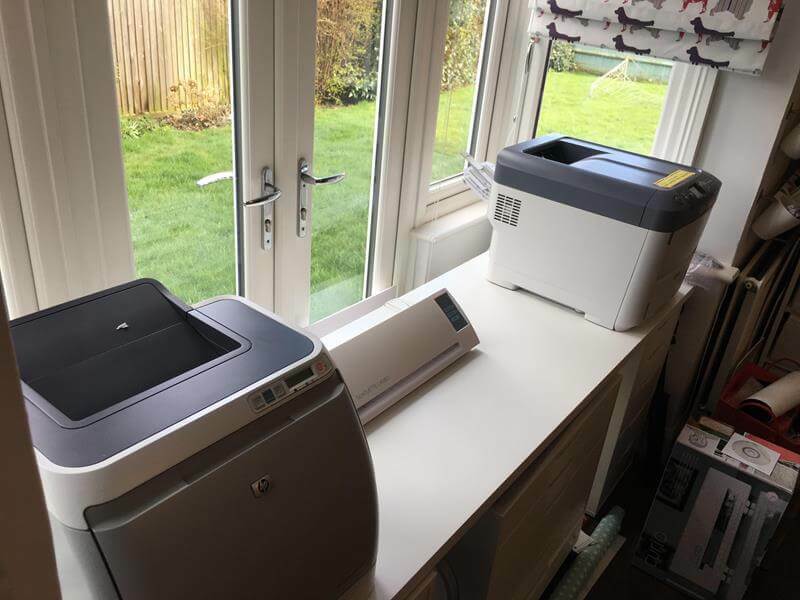 I have a colour laser printer kindly donated by my parents when they closed their business down, a small cutting machine and an OKI printer which is basically a laser printer but uses white toner instead of black. 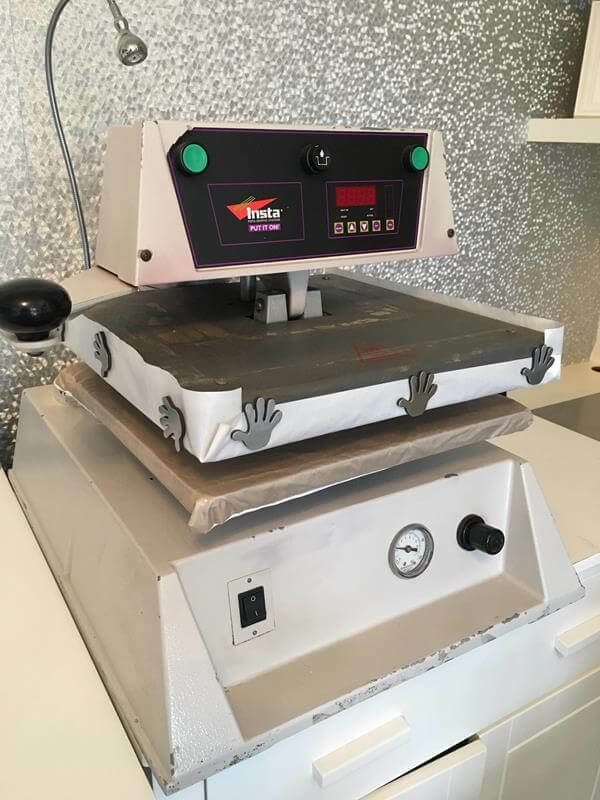 On this machine I can create transfers which can be heat pressed onto a variety of materials from garments, to metal, to acrylic and much more. In the drawers underneath I have my packaging supplies, labels and mail bags; the transfer paper for the OKI printer; cutting mats for the cutting machine, a variety of craft things like card, stickers and a whole bunch of craft that I was going to make something amazing with but never got the time to do. Opposite my desk I have 2 extra tall Pax wardrobes from Ikea which are shelved out from floor to ceiling and which hold all my day to day stock items including skating jackets, skating leggings, tshirts, hoodies and more. 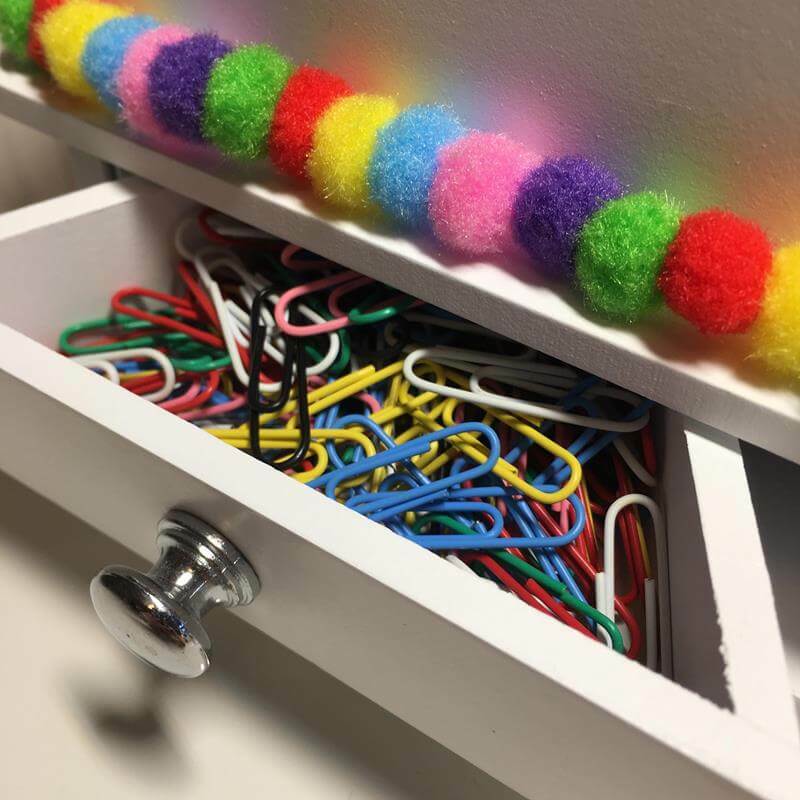 I have another room where I have boxes of even more stock but I hold a little bit of everything in these slide out drawers so that its all within easy access. 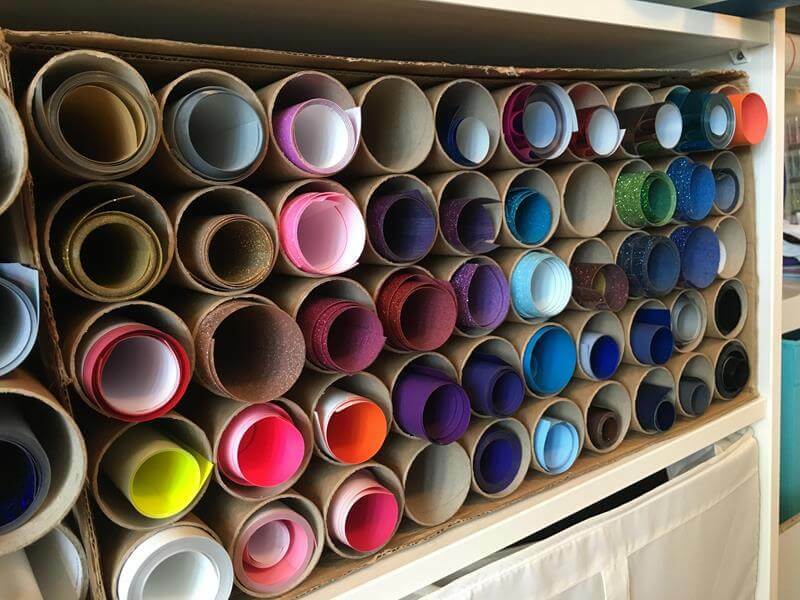 One shelf is dedicated to my vinyl rolls – believe it or not, there are about 70 rolls on this shelf! 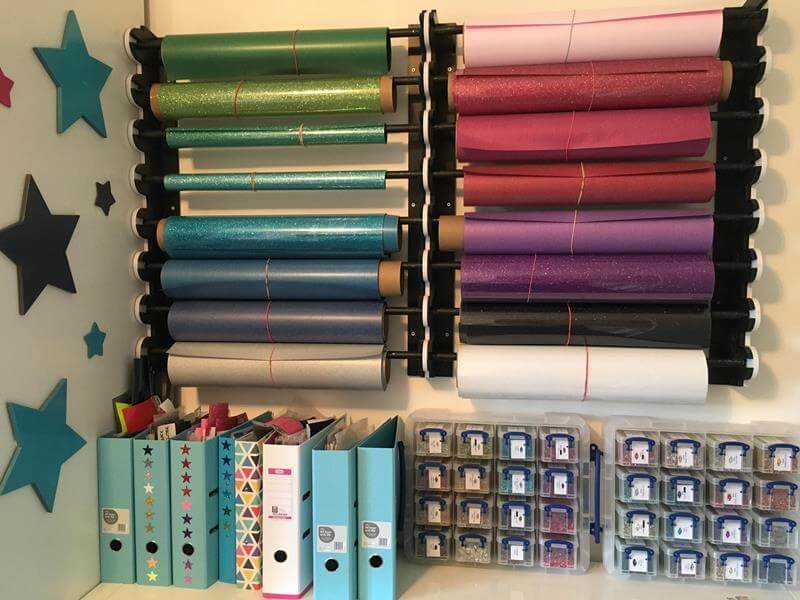 They’re grouped into sections: foils, smooth vinyl, flock and large glitter pieces. In addition, I have some large racks for my big rolls of glitter which you’ll see shortly. Above the vinyl rolls, I have boxes and bottles of my more expensive crystals. These are the ones that I use on competition costumes and are a mix of Swarovski, Preciosa and Rhinestone HQ. 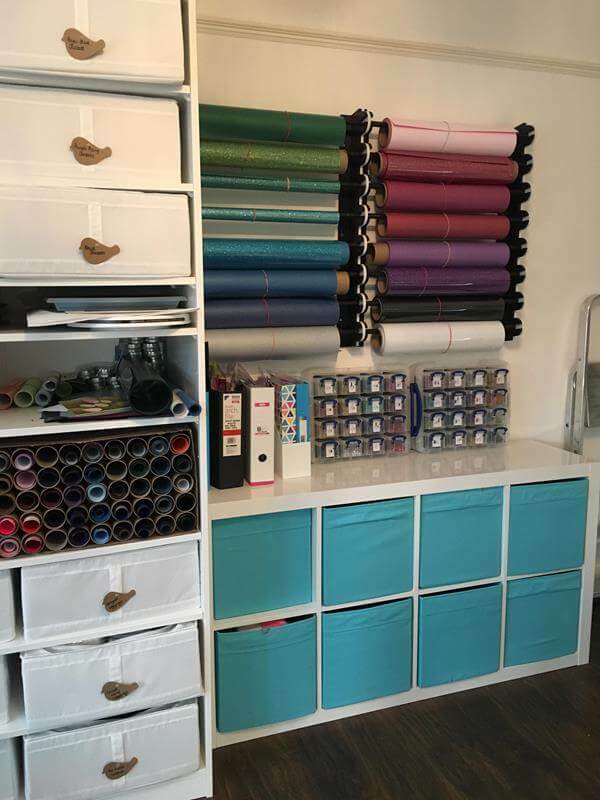 Next you’ll see my Graphix Racks which I use to store all my larger rolls of glitter vinyl. 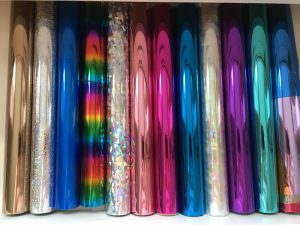 I work a lot with glitter vinyl so these are my most used rolls for easy access. Plus they look pretty now that I’ve got them arranged in rainbow order 😉 Underneath, I have folders which hold small vinyl scraps arranged by colour/type in clear file pockets; precut designs again arranged in clear pockets and design templates which are cut in a special material called Sticky Flock and stored by sticking them to clear pockets which a piece of card inserted for some strength. 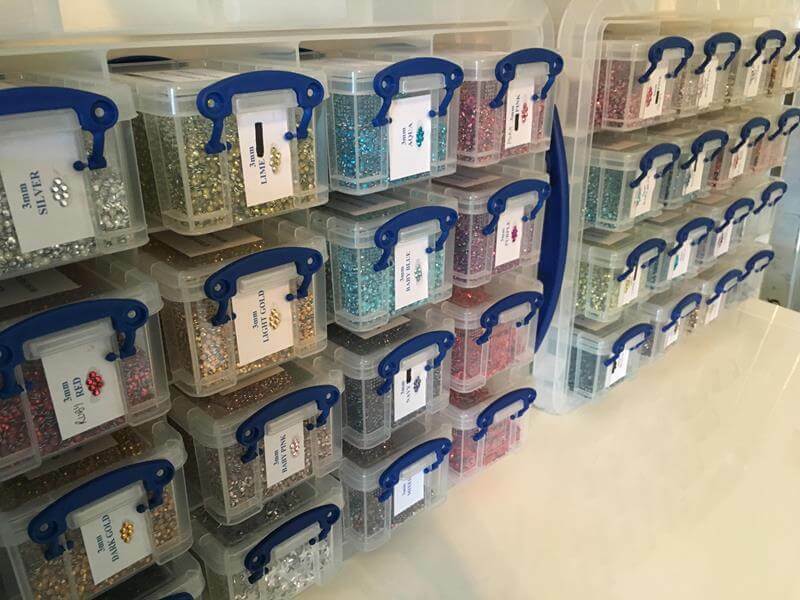 I also have all my rhinestud tubs in SS10 (3mm) and SS16 (4mm) here. 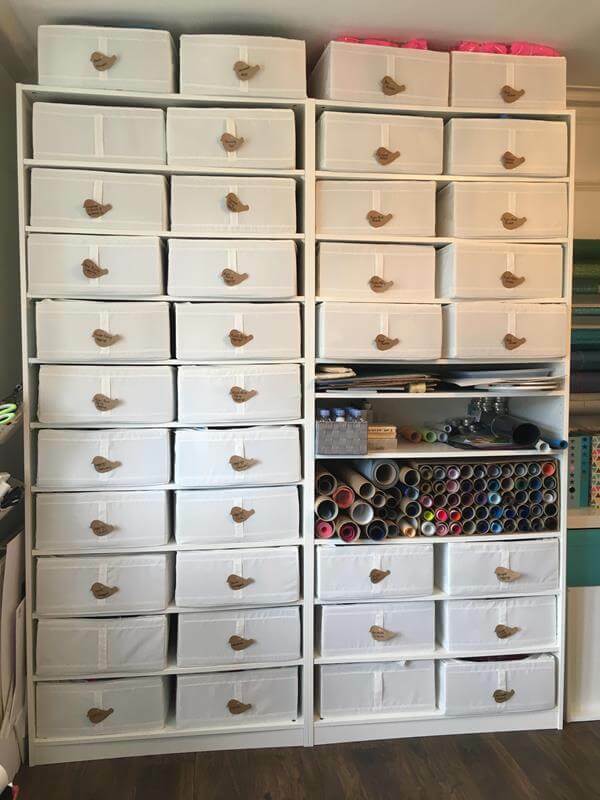 Underneath the folders is an Ikea Expedit cube storage unit which stores all my makeup bags on the top row (organised by size) and then my fabric stash (organised by fabric type) on the bottom row. Swinging round a bit further is my ‘glitter wall’. 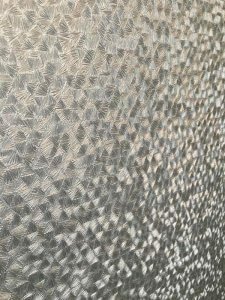 Its not actually glitter but a rather cool wallpaper which has a silver metallic finish and a textured pattern which throws the light in different directions giving the impression of glitter – a bit like the facets of a rhinestone really. This wall used to be navy blue so the light reflection from the silver wallpaper is amazing and definitely lightens up the room. Against this wall, I have 2 drawer units made from Ikea kitchen cabinets with a white table top over them (one drawer front was missing from the order hence the gap and I really must get that re-ordered!). 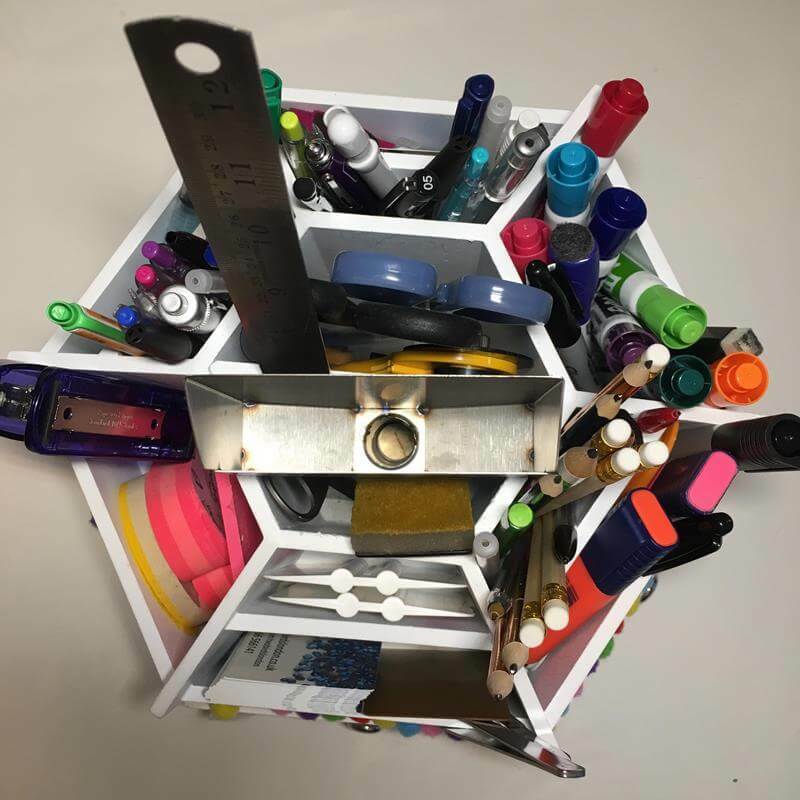 The table top is deeper than the drawer units which gives me a handy storage space behind for lots of things. 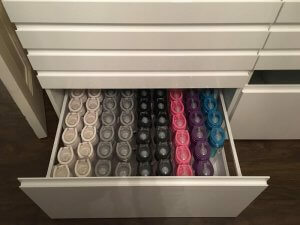 Inside the drawers I’ve got premade rhinestud transfers, all my sign vinyl and my water bottles stash! On the table top are my bottles of crystals. I store them in Evian water bottles because it was the easiest method to keep them visible but safe from spillage. 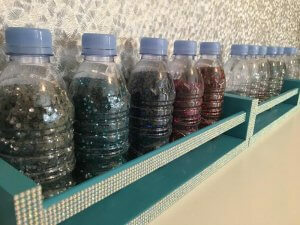 Each bottle holds around 70,000 stones! To the far right, you’ll see my ‘beast’ aka my heat press. Its not the prettiest thing but its a workhorse and so its allowed to stay. I do have another heat press but I swapped it over for this one as this one has a pneumatic plate powered by air compression and that means that my shoulders get a lot less tired when I’m in full production mode. All I have to do on this press is press the two green buttons on the front and the bottom plate magically rises to meet the top plate. After have 2 shoulder operations, this has been a godsend to keeping me mobile and the production line going. Finally, in the middle of my room, I have a table (yes its Ikea again! ), with an Ott Light on it. This is where I do most of my production work whether its creating rhinestone names or weeding vinyl designs. 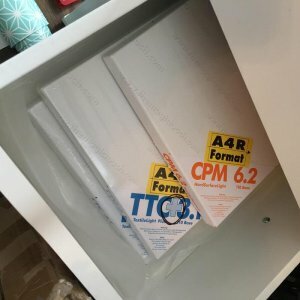 A fair bit of packaging gets done on this table too so I always try to keep it as clear as possible. In the far right corner is my till which I take to events and on top of that is my pen carousel which I got in America. I wasn’t sure whether it was going to be worth the effort but I really love this unit now that I have it and use it every day. 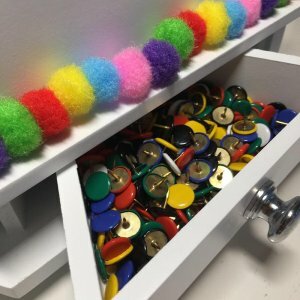 It holds a LOT and I can reach it from my desk or my worktable which means its in use a lot. And that’s it! Thanks for coming on my tour, I hope you enjoyed it! Be sure to leave me a comment below and if you’ve got any questions then just ask and I’ll do my best to answer them. 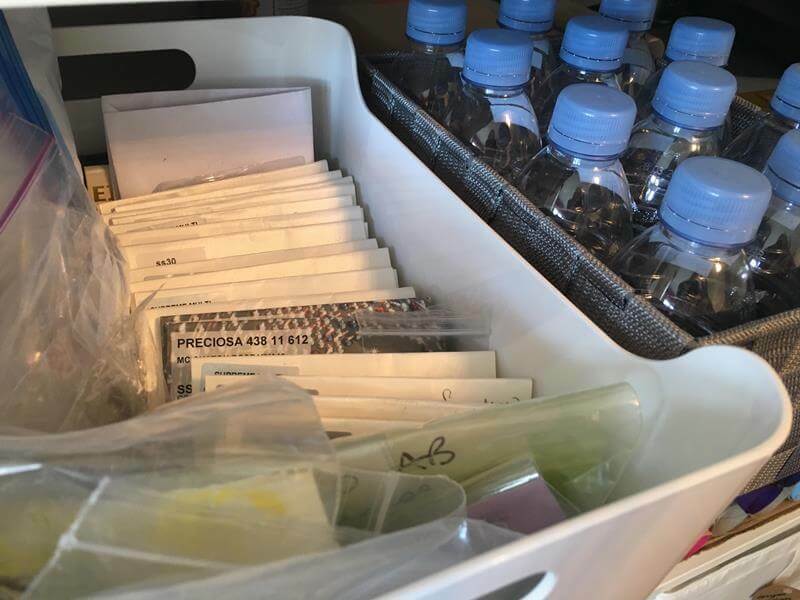 Wow, I am loving your organisation and sense of order of so many varied and tiny things! Home office envy! Also great to get an idea of the level of detail that you personally go into with all of your products. 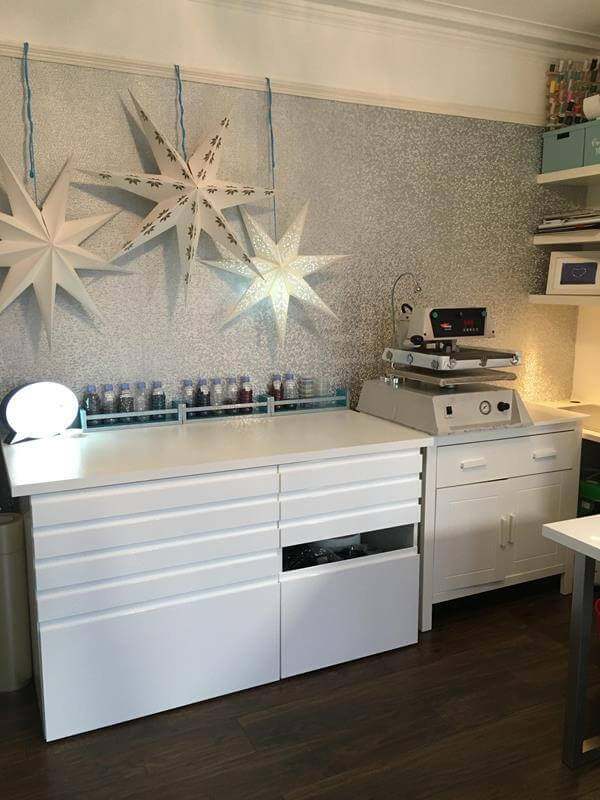 Loving seeing your work space – it’s so inspiring. 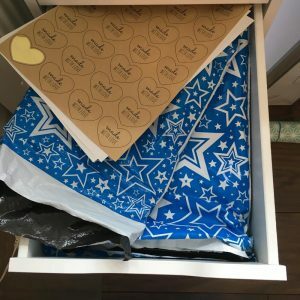 My hobby is crafting so I’m in awe of your organisation and storage however I think I would have to do a fair amount of tidying before I photographed it LOL. Maybe something for me to aim for. Thanks for letting us see where the magic happens.